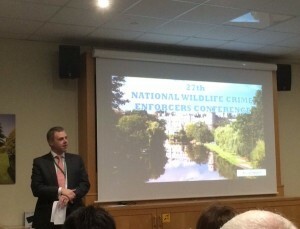 The 27th Annual Wildlife Crime Enforcers Conference took place between Friday 27th and Sunday 29th November 2015. The annual conference is where law enforcers, statutory agencies and NGOs gather to hear the latest views, approaches, successes and challenges of combating wildlife crime in the UK. PC Mark Goulding from Natural Resources Wales won Wildlife Crime Officer of the year – click here for more details. Sgt Rob Taylor of North Wales Police won a Lifetime Achievement award – click here for more details.